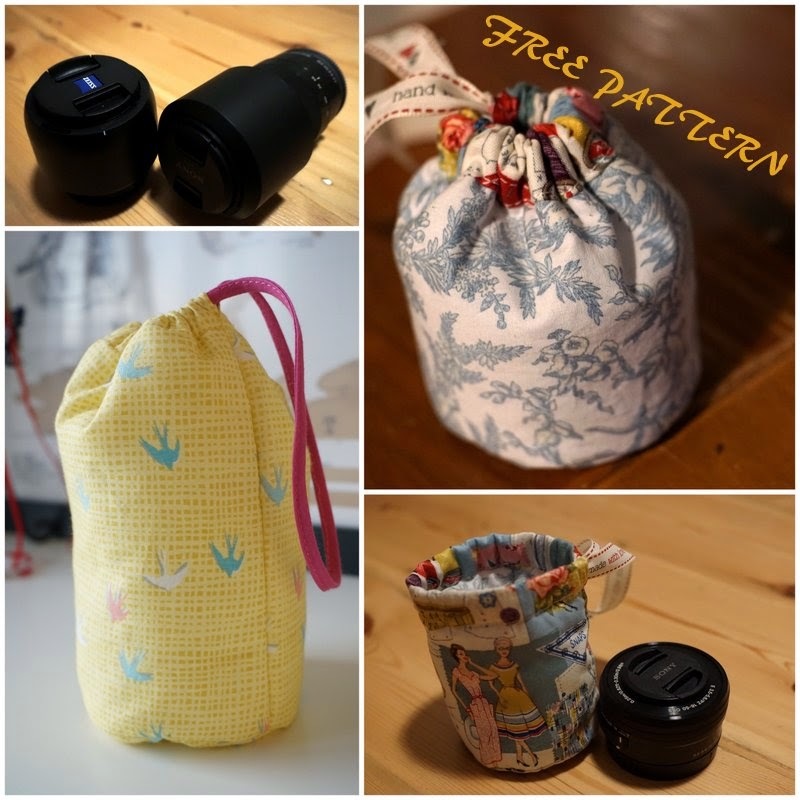 Queen of Darts: Introduce the FREE pattern for reversible camera lens cases! Introduce the FREE pattern for reversible camera lens cases! I have something completely new for you today. I have pulled together a little PDF pattern for you all! I was planning on sharing this as my giveaway for the Sew Grateful Week, but having not seen much movement on that this year, I have decided that now is as good as ever, so here it is! It's a bit of a mouthfull, but it's a simple little pattern to make padded cases for your precious camera lenses. As someone who loves travelling, as well as sharing what I’ve made, I’ve really jumped onto the photography wagon pretty late. After years of relying on point and shoot cameras, and sometimes phones, I’ve lost count of the number of times I wished I could have better captured the moment. Finally, a few months ago, I took the plunge and got myself a Sony Alpha A6000, a compact system camera. What can I say? It has been everything that I could’ve possibly wished for. But I soon found myself with a small (first world) problem – to make the most of the interchangeable lens camera, I purchased a couple of spare lenses. Despite the high cost (boy are these pieces of glass expensive! ), I was surprised that none of them had come with even a pouch. So I spent the first few weeks wrapping them carefully in bubblewrap before putting them in my padded camera bag… You can’t be too careful with glass! Then it occurred to me that I am able to solve this problem -- I can sew a few padded cases for the lenses myself. What’s more, this would be a great way of using up scrap fabrics! After doing some basic maths, I realised that it would be easier to accurately draw shapes to specifications on the computer; and then I thought, why not share it with my readers even though the pattern is simple? I’ve been thinking about digitising some of my self-drafted patterns anyway and sharing them here for free, so this simple pattern could be a test run. I also know that a lot of sewing bloggers are keen photographers – and I can guess that just by looking at the wonderful photos on your blogs! 2) I realise that this is fairly easy, and you can probably work it all out by yourself, but I hope I can save you some time by setting it all out! I’ve pitched the instructions at the beginners level, and have tried to explain each step thoroughly and with the aid of photos (if I drew, you’d be waiting for my pdf patterns for decades). Now the pattern itself. I’ve done a bit of research into the sizes of lenses, so have made 3 sizes for this pattern based on various diameters. Choose the pattern based on diameters, as the length/height of the case is easily adjustable. The below is an indication only; please do measure your actual lens before choosing the pattern size and cutting out the fabric. This size has not yet been tested as I don’t have a lens which fit into this category. Be assured though the maths works! APS-C lenses (with hood) and full-size DSLR lenses. One fat quarter for “lining” (this is notional of course as the whole thing is reversible!) - quilting fabric would work again of course, and you can go crazy with your mix and match. Alternatively you can use brushed cotton/flannel here for added softness. Great protection – it’s padded from top to bottom, so you can chuck your lenses into your handbag rather than having to carry around a camera bag. More glamorous and safer (not shouting out “I have a fancy camera” when you’re travelling is always helps in my book). The pattern also “bags in” all the seams so they would be poking out on the inside leaving fluff at your treasured lenses. Perfect use of scrap fabric – this pattern is designed to be reversible, which not only is fabulous, but allows you to mix and match your scrap fabrics, too! You can have so much fun with it! They would make great gifts – something that’s handmade and also made to measure? What a lovely gesture! The recipient doesn’t need to know that it’s simple to make! Quick to make – No need to finish seams, no closures/buttonholes to make other than inserting a drawstring! Very simple, quick and effective. It’s a free pattern – what are you waiting for? Click on the links below to download! Any suggestions/comments/feedback (good or bad) please do get in touch, as it could help me decide whether to go ahead and digitise some of my dressmaking patterns. That's great! I'm so glad that it will be useful :D Can't wait to see what you make! Do feel free to drop me a line once you've sewn it up.